The mission of Thrive to Five is to help families prepare children for success in school. The classes below are FREE to all parents and caregivers of children age birth-five. Join the fun and learn new ways to help your child prepare for success in school. ​Book Buddies is a weekly opportunity for you and your child to enjoy a story and song together and take some time to exchange your books in our lending library. Join us on a reading journey and your child will collect some treasures along the way! Learn more in our family resource center. Our Family Play Date provides a weekly opportunity for you and your child to play together and to play with new friends! Come explore a variety of learning stations, like math, dress up, puzzles, blocks, reading, games, and more! All parents struggle with the same kinds of problems. These two-hour sessions on specific topics are designed to present you with information and to share ideas with other parents struggling with the same issue. In this parent-only class, you will learn CPR and First Aid skills and receive CPR certification. Participants must stay the entire 4 hours to receive the CPR certification. Free Childcare provided until we reach capacity. It's a New Year and time to learn some new skills that will help us live healthier and more financially secure. In this class, presented by Valley of the Sun United Way, you will learn the five food groups and MyPlate , key nutrients in the five food groups for optimal health, portion sizes and daily recommendations for the five groups, cultural connection to food and finances, set realistic personal/family financial goals, budgeting, financial priorities, long range planning and physical activities. This 4-week series for parents of children 0-5 years old will help you nurture your child with a “just right”combination of freedom and positive discipline. Participate in First Five Years™ & learn: your child’s development and growing brain, preventing tantrums and other problems, using mindfulness to keep calm, and six ways to prepare your child for school success. Lunch will be provided to adults during each class session. All parents struggle with the same kinds of problems. These sessions on specific topics are designed to present you with information and to share ideas with other parents struggling with the same issue. 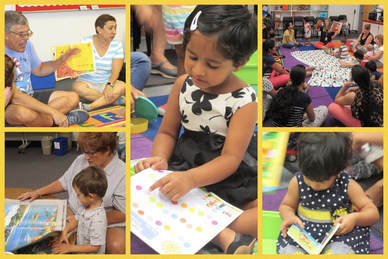 Come enjoy a fun story time and learn some new rhymes and songs for you and your 0-3 year old! A fun time to practice language and literacy skills together. Each family will receive a copy of the story time book at the end of the class session. Come enjoy a fun story and craft activity together. Each family will receive a free children's book at the end of the class session. Come in your pajamas and enjoy a night time story and songs together. Each family will receive a free children's book at the end this class. Join us for a special Valentine's Day storytime and craft. Each family will receive a free children's book at the end this class. Our Support Group is a time to discuss a variety of tools and opportunities to help achieve our personal goals such as education, employment, homeownership and more. Free childcare provided during this class. 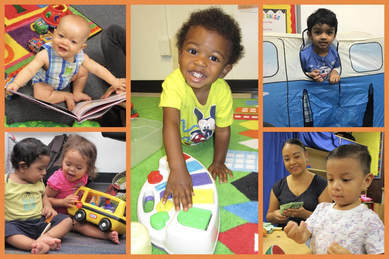 Brain Time © is a fun, interactive setting where parent/caregiver and child learn together. This workshop is taught in three sessions and follows a basic library-style ‘storytime’ format, but includes one-on-one time for the parent/caregiver and child to work and play together.Brain Time © utilizes New Directions’ patented Brain Box ® learning system. The Phoenix Zoo comes for a visit! Move, roll, bumble, flutter and crawl… there are bugs that do them all! We will meet, learn and explore bugs, bees, beetles and more! There will also be a bug book storytime! We will be reading a story and playing with playdough! Learn different ways of using playdough to develop your child's skills. Enjoy a Science, Technology, Engineering or Math (STEM) story with your child, followed by some science experiments and innovations! 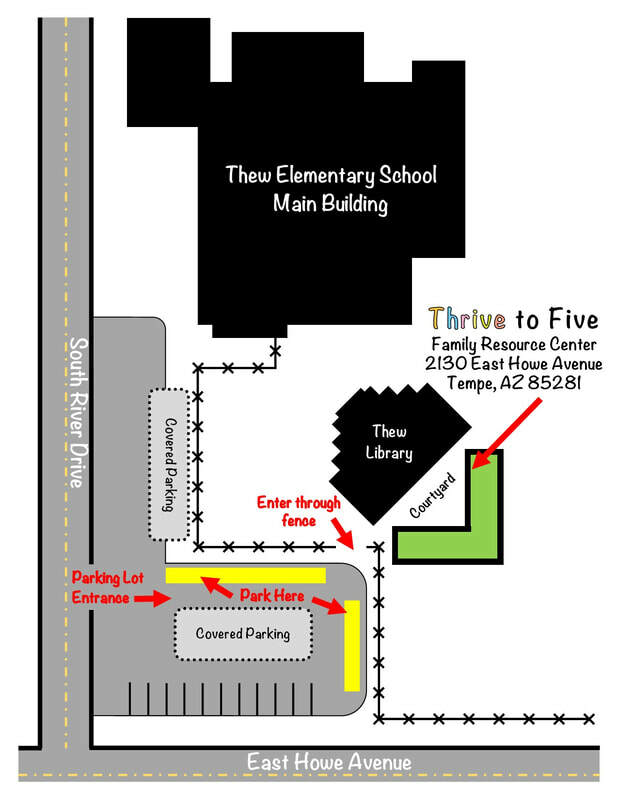 Here is a map of our Thrive to Five Family Resource Center, including convenient parking next to our entrance. When you arrive, just ring the doorbell at the gate and a Thrive to Five staff member will greet you and let you in. You do not need to go through the Thew front office for Thrive to Five classes.